A simple pencil holding jig allows me to scribe a line at just the right spot for trimming down the planking for the outer gunnel. 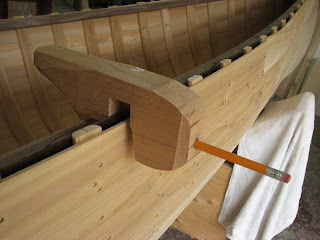 I like to have the lip of he outwale fit close to the top of the planking without any gaps. This makes it easy. This sort of jig is also why I bought a proper pencil sharpener instead of just using my utility knife, the jig only works if the pencil point is consistently centered. With the planking finished it is time to clean out any tack burrs from inside the ribs. If these are not removed the sander will catch them and create deep swirls in the cedar. 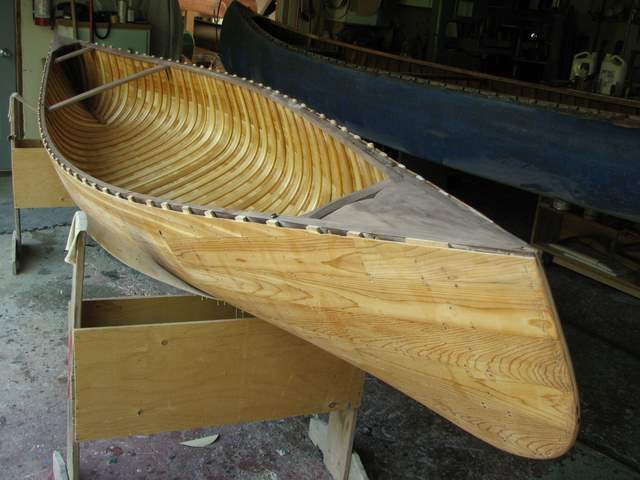 Next is to sand the ribs. 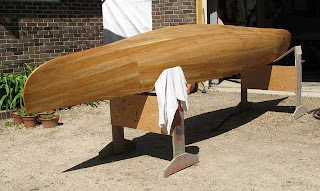 The planking was sanded beforehand, but the steaming process raises the grain on the ribs and this needs to be sanded prior to varnishing. Varnish really shows off the new wood! I have used many types of varnish, but now I am sold on Epiphanes. It is predictable, builds up well so fewer coats are needed, and it doesn't run and sag much up near the gunnels! It doesn't matter how much you go back and check your work there always seems to be some sagging going on there. I varnish prior to canvas so that the varnish does not wick between the planking and soak into the canvas. This seems to be the source of the dreaded paint blisters! Uncured varnish in the canvas heated by the sun. I have never had a repeat of the blister problem since reversing my canvas/varnish protocol. Once the varnish is done it is time to fair the hull exterior. 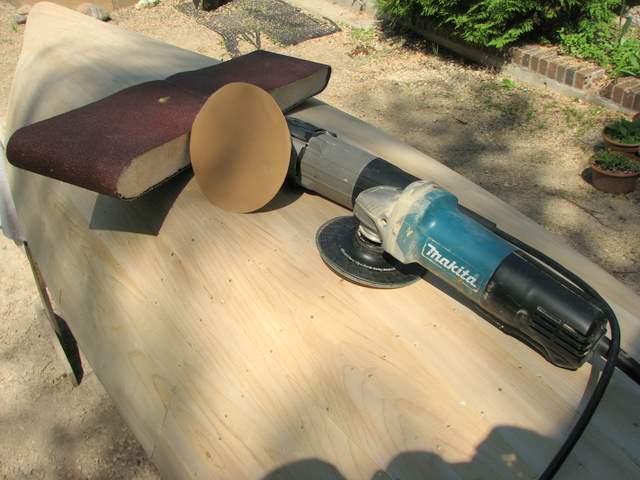 I use my angel grinder to knock down the obvious high spots. This tool is fast and can cause damage quickly if you are not experience with it. It also makes a lot of dust, so you need to be prepared for that. After the grinder, I pull out my big sanding block to further refine the surfaces, then I go over the hull with my random action sander, both 100 and 220 grit. 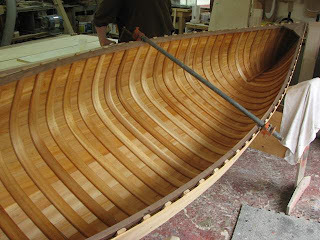 I finish with a coat of linseed oil and let it dry overnight prior to canvassing. Finished hull showing the interior. Posted by Doug Ingram at 11:07 p.m.